The PGCC Library is located on the first and second floors of the Accokeek Hall. Circulation Services is located on the first floor of Accokeek Hall. Services include circulating books, multimedia, reserve materials, issuing photo identification cards, and assisting with the photocopying equipment. Most services are available to both the College community and the general public. The Research / Information Desk is located near the front door and is staffed by a professionally trained librarian all hours that the library is open. The librarians answer questions and offer direct personal assistance on using the Library's electronic and print sources to find information for research and study. 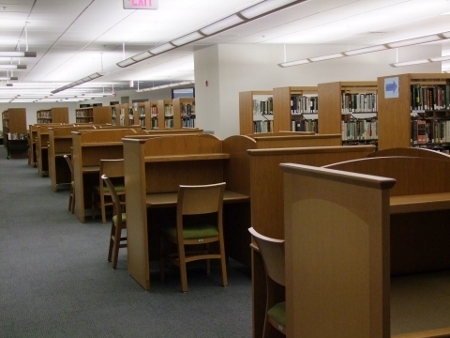 Study areas are on the first floor in the reference area, the periodicals area, and against the back wall. Additional individual study areas (carrels) are available throughout the 2nd floor. 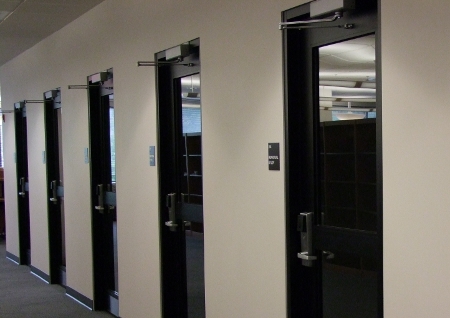 Eleven individual study rooms (1-2 people) and carrels are available on the second floor. Group study rooms (3 - 6 people) are on the first and second floors of the building. All group study rooms have whiteboards and computers. Markers and erasers are available and can be requested at the Circulation Services Desk and the Administrative Office (Room 200). Group study rooms are for use by current PGCC students only. Guests may use the individual study rooms during the following times: Monday - Friday after 4:00 pm and Saturday from 10:00 am to 3:00 pm. For the second floor: go to the Administrative Office (room 200) for access from 8:30 am - 3:45 pm. Each student must present a current valid PGCC photo ID to enter all study rooms. No other photo ID will be accepted. Anyone occupying rooms will be held accountable for adhering to these rules. Those violating the rules will be restricted from future use. Campus police will be called for repeat offenders. The PGCC Library offers over 30 computers for use by students and other library patrons. These computers are located on the first floor near the information service desk. The computers provide access to all electronic resources, including the Library's catalog, e-books, streaming videos, and research databases. Users will need to log in with their Owl Link ID and password. Library staff at a service desk may login patrons if ID and password are not available. Computer use is first-come-first-served. There is no sign-up or time limit; however, priority is given to those who need use of the computers for research purposes as opposed to recreational use. The photocopiers are located next to the Accokeek Cafe on the 1st floor. Photocopy print jobs cost 10 cents per page. The printer is located on the 1st floor at the Circulation Desk. There is a 10 cents per page fee for black and white printing and a 25 cents per page fee for printing in color. Payments for printing are to be made at the Circulation Service Desk at the time one retrieves a print job. A touchscreen scanner is available on the first floor. Patrons are able to scan books and documents into searchable PDF, Word doc, JPEG with the click of a button. Send scanned files to email, smartphone, tablet as well as Google Drive at no cost. Photo IDs for students and college employees are processed at the Circulation Services Desk. This is the large desk facing the entrance of the building. Photo ID hours are posted each semester. Call 301-546-0475 when the library is open to speak with a circulation services staff member. Currently enrolled students who have already received a student photo identification card are validated each semester. There is a $10.00 replacement fee for lost or stolen cards.